AIPFE Cyprus-Women of Europe has joined forces with EY Ernst Young Cyprus and CIM Cyprus Institute of Marketing to locally relaunch the successful European initiative Women Fit for Business (WF4B) Cyprus. 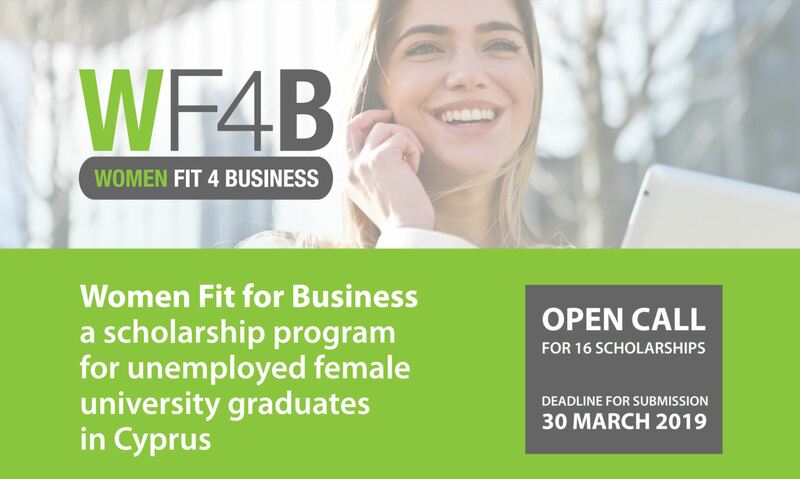 WF4B is an intensive 8-month collaboration targeting young, unemployed, female university graduates, under the age of 35. It aims to help close their ‘condence gap’ and provide them with the necessary hard and soft skills to enter/re-enter the labor market and/or start their own business. Sixteen candidates will be chosen through a competitive interview selection process. The program, which will commence in March and run through October 2019 will cover a wide range of topics, comprising of gender diversity, female leadership, communication skills, social media and digital marketing, women in STEM, etc. Interested applicants may send their CV with a letter of interest detailing the reasons they wish to apply for this program and the professional benefits that can be accrued through the attainment of soft skills. A very good command of the English language is imperative as the program will be conducted in English. Applicants must also send the names and contact details of two referees. All applications must be received via email to info@aipfe.com by 30 March 2019. Successful candidates will be selected to embark on a 48-hour, 8-month course, which includes training, internships and mentoring. Applicants in temporary/part-time employment, part-time education, and/or professional courses will be considered on merit.